32 | TH E M R EP O RT Special Advertorial Section COMPLIANCE COMPANY INDEX KEY PERSONNEL Steve Salimbas CEO Peter Heretakis Director of Business Development STAFFING Employees: 5 CONTACT INFORMATION 625 Middle Country Road Coram, NY 11727 Phone: 800.240.9190 Email: peter.h@allyconnect.com Web: AllyConnect.com AllyConnect.com Corporate Profile Centralized and automated vendor resource management and compliance solution. Company History Service was launched in 2016 to address the complexities and provide transparency to vendor onboarding, maintenance, and compliance management for field services companies. Regulatory Compliance AllyConnect is a turnkey solution specifically designed to meet the compliance needs of the mortgage field services industry. 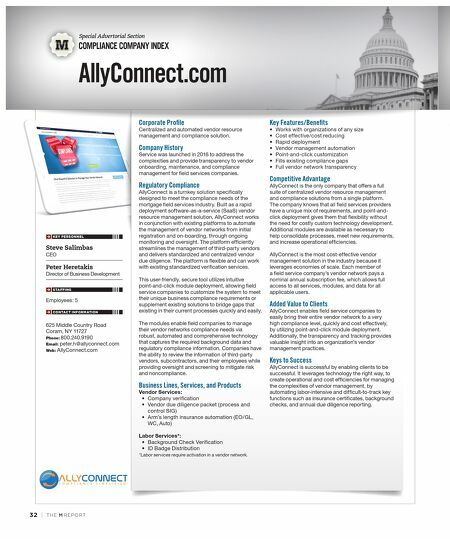 Built as a rapid deployment software-as-a-service (SaaS) vendor resource management solution, AllyConnect works in conjunction with existing platforms to automate the management of vendor networks from initial registration and on-boarding, through ongoing monitoring and oversight. The platform efficiently streamlines the management of third-party vendors and delivers standardized and centralized vendor due diligence. The platform is flexible and can work with existing standardized verification services. This user-friendly, secure tool utilizes intuitive point-and-click module deployment, allowing field service companies to customize the system to meet their unique business compliance requirements or supplement existing solutions to bridge gaps that existing in their current processes quickly and easily. The modules enable field companies to manage their vendor networks compliance needs via robust, automated and comprehensive technology that captures the required background data and regulatory compliance information. Companies have the ability to review the information of third-party vendors, subcontractors, and their employees while providing oversight and screening to mitigate risk and noncompliance. Business Lines, Services, and Products Vendor Services: • Company verification • Vendor due diligence packet (process and control SIG) • Arm's length insurance automation (EO/GL, WC, Auto) Labor Services*: • Background Check Verification • ID Badge Distribution *Labor services require activation in a vendor network. 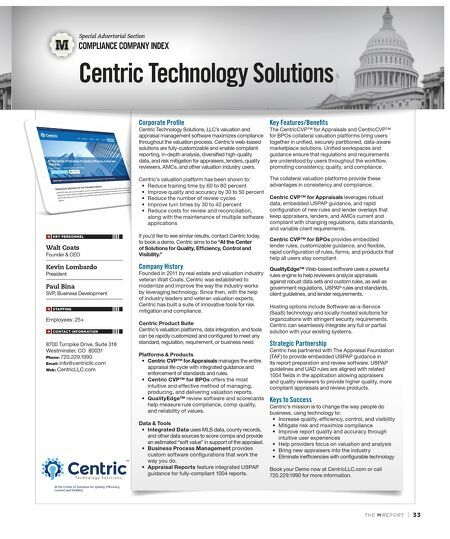 Key Features/Benefits • Works with organizations of any size • Cost effective/cost reducing • Rapid deployment • Vendor management automation • Point-and-click customization • Fills existing compliance gaps • Full vendor network transparency Competitive Advantage AllyConnect is the only company that offers a full suite of centralized vendor resource management and compliance solutions from a single platform. The company knows that all field services providers have a unique mix of requirements, and point-and- click deployment gives them that flexibility without the need for costly custom technology development. Additional modules are available as necessary to help consolidate processes, meet new requirements, and increase operational efficiencies. AllyConnect is the most cost-effective vendor management solution in the industry because it leverages economies of scale. Each member of a field service company's vendor network pays a nominal annual subscription fee, which allows full access to all services, modules, and data for all applicable users. Added Value to Clients AllyConnect enables field service companies to easily bring their entire vendor network to a very high compliance level, quickly and cost effectively, by utilizing point-and-click module deployment. Additionally, the transparency and tracking provides valuable insight into an organization's vendor management practices. Keys to Success AllyConnect is successful by enabling clients to be successful. It leverages technology the right way, to create operational and cost efficiencies for managing the complexities of vendor management, by automating labor-intensive and difficult-to-track key functions such as insurance certificates, background checks, and annual due diligence reporting.